I’m starting the year by making another set of mini object boxes for therapy but this time I’m focusing on my students with Childhood Apraxia of Speech. I work with preschool-aged students and we get really tired of flashcards. 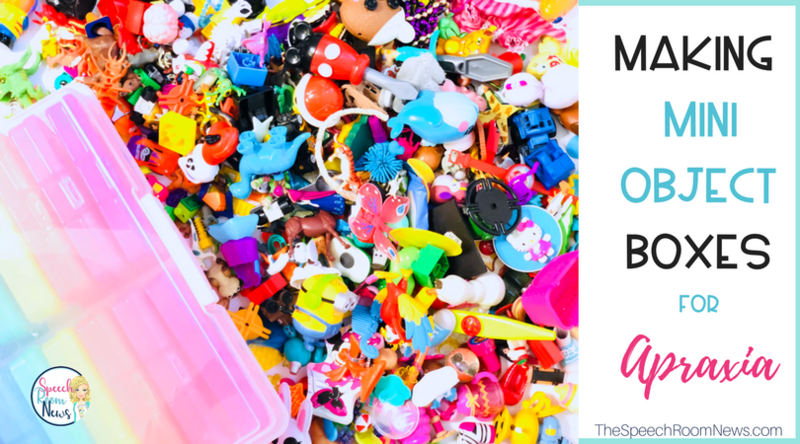 Using mini objects instead is a super fun way to make repetitive therapy more engaging. Let me show you how I set up my boxes. I’ll write a follow-up post with some ideas for using the boxes once you’ve created them! Step one is to gather mini-objects. What worked best for me was asking parents of my students and my own friends and family. 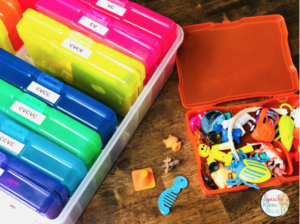 All my classrooms use closed Facebook groups to communicate with families, so I put out a plea to parents asking for the “junk” at the bottom of their toy bins. I included a picture so they’d know I only wanted small toys and clarified no stuffed toys because they can’t be cleaned. I also put a post in my local buy/sell/trade group and some families collected bags for me! I put the same post on my personal page and a week later, I followed up asking for any other donators. I got about 10 families to donate little bags and that was enough. Plus, I keep the random things I find throughout the year in a drawer so I threw those in! Step 2. Lay down in the madness and take a selfie. This step is not required but highly encouraged. Except, then you will follow it up with step 3. 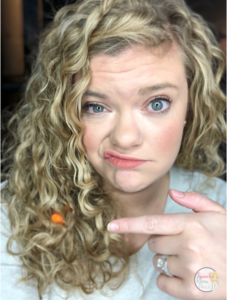 Removing mini objects from curly hair. OK, back to the serious stuff. Step 4! Lysol everything because, GERMS. And start sorting. I grabbed three bins and went hunting for CV, VC, and CVC bins first because a lot of my students are at that level. 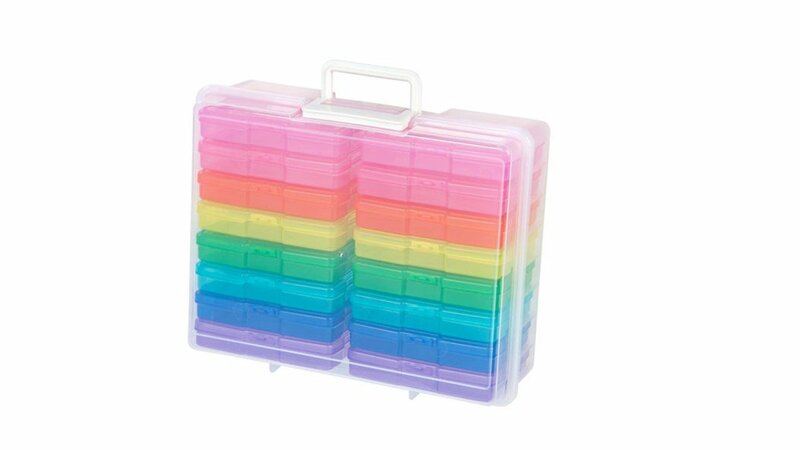 You can also sort by sound like I did with my articulation mini objects boxes (more info here). Step 5. Label your storage container. I use this (aff. link) Recollection Photo Storage Container. You can use your Michael’s coupons and find it on sale! It holds 4×6 photo boxes inside. You can make bigger boxes, but you have to think about portability. These are super easy to be portable. After I sorted CV, VC and CVC, I added CVCV, and CVCVC. Then you can go to blends or multisyllabics depending on where your students are. It gets hard to think of words, but I just look at the objects and think through them in my head, rather than looking for a specific item to match a word list. I had lots of extras that didn’t match my word structures so I just added them to my articulation boxes. That’s it! What do you think? Do-able? I used to have many small items too. McDonald’s and Burger King happy meal toys have been great. I got rid of most of them over the years and just keep the ones I need for testing purposes. if you are looking for particular items go to EBay and put in happy meal toys and you will find it is just AMAZING what people have kept for decades. In original packaging it’s still good! One thing: When plastic gets old it smells BAD. We all know the smell. I’ve cleaned out therapy rooms and classrooms from people who have retired and thrown out some hideous smelling stuff. Just remember it will eventually get funky and you might get used to the smell so might need a new person’t nose to check out he collection every so often. Big fan of the idea and collection. 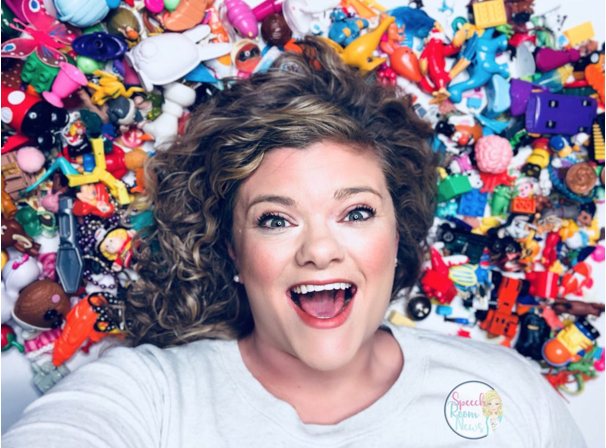 If you have a budget or use Donorschoose.org, you can buy Lakeshore’s collections of toys in bins. They have them for initial alphabet, vowels, and I think Spanish words also. More pricey- but if you don’t want to wait or have the opportunity to get these, they are worth it. What kind of labels to you use on the boxes? I’ve tried some but they just fall off after awhile. I use label maker ones! The laminated version. Maybe make it a summer project! I’m pretty swamped myself 🙂 Just keep swimming! I have used “sound boxes” for years. I collect give aways and as one person said, Happy Meal toys. However, my boxes are in shoe box size containers and these are not so portable when moving from a large therapy room to the downsized room. SO,,,,,,I love your idea with the mini boxes. I am going to downsize and get those boxes back into the therapy room and out of my basement! Jenna, can you post the picture you sent to families as an example when collecting? I would love to do this also! I LOVE this idea!!! I can’t wait for the follow up post. I have so many kids with CAS on my caseload and, yes, we are tired of the flash cards! Do you have a list of examples of items you put in each box? Do you have a list of items you have in each box? Would you please provide a list of the groups you labeled for your Apraxia Boxes? I can only see 4 groups, and have lots more boxes to label!! What is a great resource for knowing how to proceed beyond the CVC level? Need a great resource (website or hard copy) for overall apraxia therapy. Thanks! IKEA has great small boxes that can be purchased in a package of three that could be used to create sound boxes.